What do Van Gogh, Shakespeare, the Hopi and Kayukon People, Mark Twain, and the rock band The Counting Crows have in common? They all draw inspiration from some of our most common, but least understood birds: the crow and the raven. Raven and crow scholar John Marzluff will present “In the Company of Ravens,” as the second installment of the 2008 UAS Evening at Egan Lecture Series. John Marzluff is Professor of Wildlife Science at the University of Washington. He also holds the Denman Chair in Sustainable Resource Sciences and directs the Urban Ecology Program at UW. His recent book, In the Company of Crows and Ravens (with Tony Angell, 2005 Yale U. Press) blends biology, conservation, and anthropology to suggest that human and crow cultures have co-evolved. The book won the Washington State Book Award in 2006. 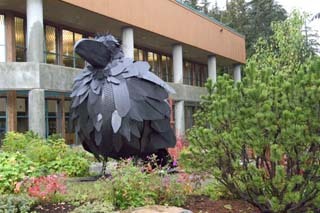 Prior to the lecture, Chancellor John Pugh and UAS Alumni President Bob Mitchell are celebrating the Dedication of the Raven Sculpture in the Mourant Courtyard, Auke Lake Campus at 5 p.m. The sculpture was made possible in part through a generous gift by UAS Alumni & Friends. Special guest Sculpture Artist and UAS Alumna Lisa Rickey will be in attendance. The Evening at Egan lecture series is held every Friday at 7 p.m. through November 21. The September 19 lecture is “Remote Sensing of Mountain Goats in Southeast Alaska” by Mark Riley, Remote Sensing Specialist, USDA Forest Service. Visit the Evening at Egan Website for all scheduled lectures.